Law enforcement officers of all stripes strapped on their running shoes Thursday for the Kitsap leg of the Special Olympics Law Enforcement Torch Run, where officers carry the Special Olympics torch by land and sea to Joint Base Lewis-McChord. Here’s more information on the Special Olympics. The list of agencies participating in the event is nearly comprehensive, and includes the departments of Bainbridge Island, Poulsbo, Bremerton, Suquamish, along with the Kitsap Sheriff’s Office, the U.S. Coast Guard (MFPU Bangor), N.C.I.S., the Washington State Patrol and the Kitsap Prosecutor’s Office. And here are some photos from Deputy Tim Young. Sheriff’s Det. 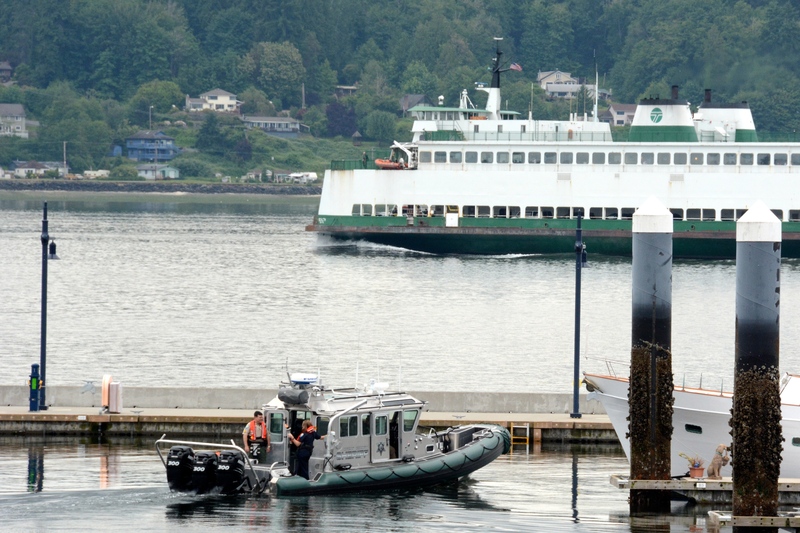 Ray Stroble pilots the Sheriff’s Office SAFE Boat out of Bremerton Marina early Thursday afternoon, with the Special Olympics torch carried by Sheriff’s Corrections Lt. Genie Elton. Sgt. Jim McDonough of the sheriff’s marine services unit assists. 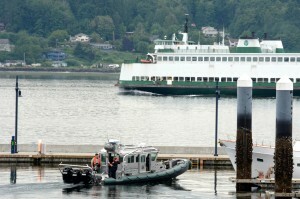 In the background, the M/V Sealth departs the Bremerton Ferry Terminal for the 12:20 crossing to Seattle. 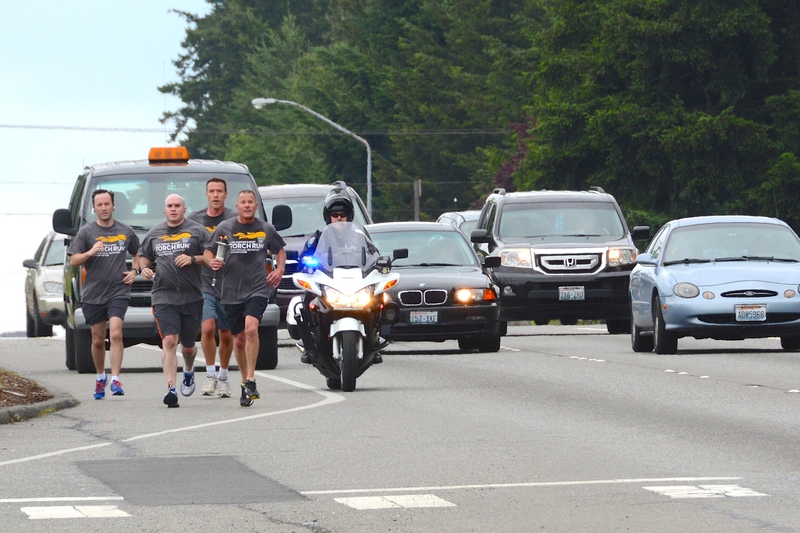 The county team passes the Special Olympics torch to the Bremerton running team, made up of officers and detectives from the Bremerton Police Department and cadets from the Washington Youth Academy. Kitsap County Sheriff’s Sgt. 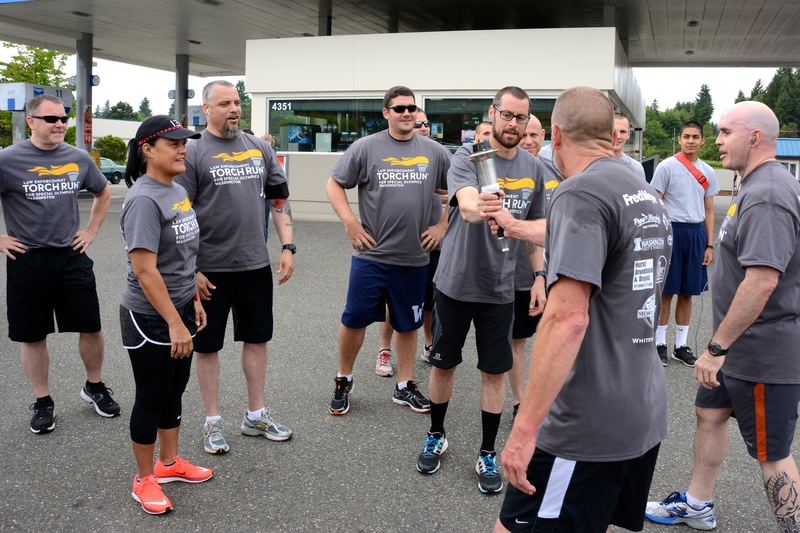 Jim Porter passes the “Flame of Hope” to Bremerton Police Detective Ryan Heffernan, prior to the start of the Bremerton leg of the run. The rifle at the center of a legal battle halfway through its second decade is now in the custody of federal agents for inspection. Earlier this week, a Kitsap District Court judge dismissed a suit against Kitsap Rifle and Revolver Club Executive Officer Marcus Carter that claimed he unlawfully possessed a machine gun. The rifle was seized in 1999. Carter had asked that Judge Stephen Holman dismiss the case and return the 1970s-era AR-15 to him. Holman dismissed the case, but in his decision Holman noted that he would not rule on returning the rifle to Carter. A story in the Kitsap Sun on Wednesday, written by me, incorrectly stated that Holman ordered the rifle be returned. Kitsap Prosecuting Attorney Russ Hauge said his office would file a motion to reconsider, and if that doesn’t work he will appeal the case to Superior Court. By law, a machine gun doesn’t require the trigger be pressed for each shot, it can shoot five or more bullets per second and, most important to this case, has a separable device that can supply the rounds, or a magazine. Magazines are known commonly as clips, much to the chagrin of gun aficionados. According to court documents, the state had to prove Carter had “dominion and control” over a magazine that could supply the rounds to the rifle. Carter claimed the state couldn’t prove it. Holman agreed. Meanwhile, the U.S. Bureau of Alcohol, Tobacco, Firearms and Explosives has taken custody of the rifle at the request of the Prosecutor’s Office. Deputy Scott Wilson, spokesman for the Sheriff’s Office, said the Sheriff’s Office has been the custodian for the rifle, which is considered evidence. He said it was removed from storage Wednesday and turned over to the federal agency. Hauge said his office requested the bureau inspect the weapon. “We asked the (bureau) if they are interested in looking at it and see if it is anything other than a machine gun,” Hauge said. Want to know what comes between me and my Calvins? A 47-year-old man arrested on a Pierce County warrant Wednesday offered a mind blowing reason for why a Kitsap sheriff’s deputy found a small bag of meth in his pocket: the pants he was wearing were not his. The man was arrested in Port Orchard shortly after midnight when law enforcement officers received a call about a possible burglary at a house being remodeled, court documents said. A Port Orchard Police officer was unable to get the man to come to the door. A sheriff’s deputy threatened to kick in the door and send a police dog inside. The man complied. Officers discovered the man had been sent to the house by its owner to watch for burglars, but also found he had a felony warrant for malicious mischief. While being booked in the jail, the deputy found the baggie of drugs in his right front pocket. “As the bag was pulled out, (the man) said, ‘These are not my pants,’” according to documents. A casual reader might think this is funny. That casual reader would be wrong. Dead wrong. Discovering that one is not wearing one’s own pants is a terrifying experience. There are numerous accounts of other poor souls finding themselves railroaded by our criminal justice system after realizing they have been tricked into the pants of somebody else. And then had drugs planted on them. Here is one. And another. And yet another. So next time you are approached by a law enforcement officer, make sure you are wearing your own pants. If you are not, quickly strip naked. A 45-year-old Bremerton man was charged Wednesday with second-degree assault for jumping onto the bed in which his tenants were sleeping, brandishing a large knife and demanding they pay rent immediately. When police arrived at the house on Tuesday they found the suspect apparently taken aback that the tenants had called the police. The suspect “seemed surprised to see us as he was eating his breakfast from a bowl,” the officer wrote. The victims said they were lying in bed in the basement they rent for $450 a month and woke up to the suspect standing over them with the knife, pointing the blade at their heads and “screaming that he wanted the rent paid now,” the report said. One victim said he had paid $49 toward the rent the day before. The suspect then folded the knife and went upstairs. When questioned by police, the suspect said, “all he did was ask them to leave, and to get out of his house.” He refused to say if he had gone downstairs that morning. Police inspected a knife the suspect had on him and reported it had a four-inch blade. He was lodged in the Kitsap County Jail on $100,000 bail. The New York Times, in writing about the U.S. Supreme Court rendering a tight, partisan decision that found prayer before town meetings was not a violation of the Constitution, published a related story on the partisan voting habits of justices. Political scientists found that judges ruling in First Amendment cases favor speech with which they agree. The implication is that judges are above passion and prejudice, and this research should come as a shock. Of course, the thought that a person, any person, can be 100 percent impartial is very comforting, especially at a time when we are inundated from all sides with information and decontextualized data. 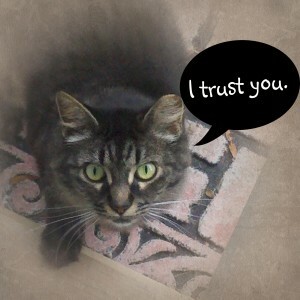 At least I find the thought comforting. 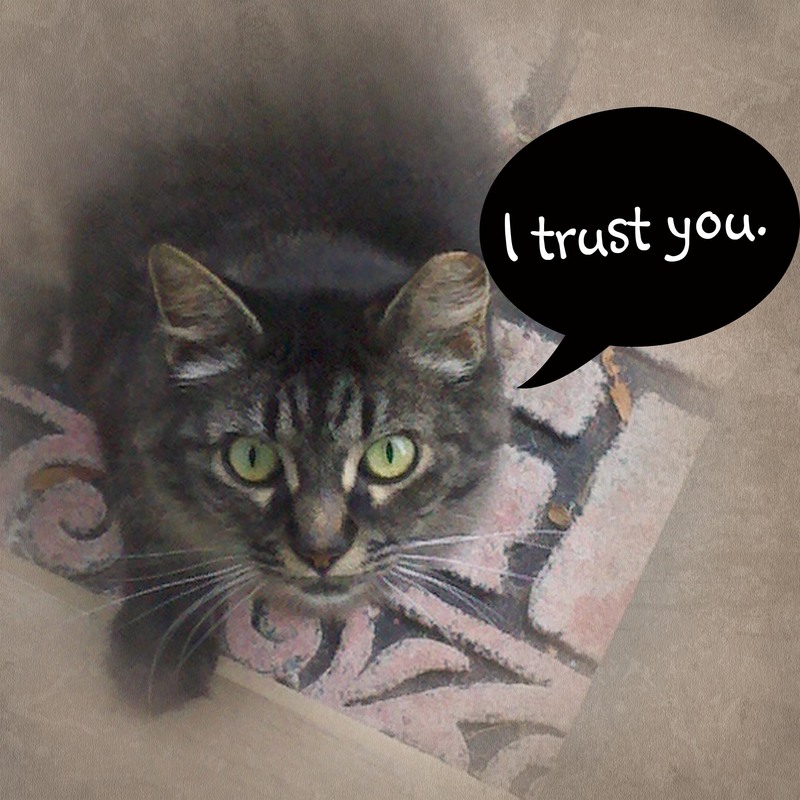 Kind of like the thought that my cat won’t eat me if I should die while locked in my house. I’ll be locking my cat out of my room at night from now on. When Linda Malcom’s family gets together, or passes the phone around at holiday gatherings for siblings living afar, there is this constant feeling that something isn’t right. 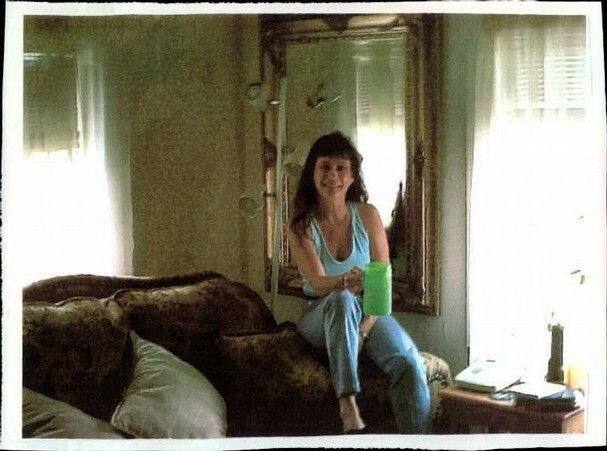 And even when they joke around about their late sister and daughter, when they ask “What would Linda say about that?” or recall some goofy thing she did, invariably the mood changes and the loss is felt. April 30 marked the sixth anniversary of Linda’s death, who was 47. Her rental house on the 1100 block of Sidney Avenue had been set on fire, likely to conceal the crime. Her death is one of 32 unsolved murders in Kitsap County dating back to 1961. Although the killers have not been brought to justice, there are developments in the cases that keep detectives rethinking and theorizing. Just last week the remains of a young man found in South Kitsap in 2009 were identified. Port Orchard Police Chief Geoffrey Marti said investigators assigned to the case will rotate, with Det. Beth Deatherage becoming the primary lead. Det. Jim Foster, who has been on the case for four years, will rotate back to assignment as a uniformed officer, but will be on day shift with Deatherage so they will be able to compare notes. Marti said the investigators will review the case and reinterview sources. Some have moved out of the area, and others have died. Linda’s family has been steadfast in pushing for more information, to get her name out and to appeal to the decency of those with information about her death. “We don’t forget,” Dianna said. Raised in Springfield, Ill., the Navy brought Linda to Kitsap County. Despite being two time zones away from her hometown on the prairie, and her big family — she was one of nine kids — she decided to stick around. She worked as a paralegal and liked singing karaoke. Linda is buried in Springfield, and her family keeps her grave clean and will pour out a bit of wine in her honor. Her mom is mobile, and tends to the gravesite. Her dad has more difficulty getting out of the house, but it is their wish to see justice delivered before they die. “I don’t think (mom) wants to go before she knows who did this to her daughter,” Dianna said. Those with information on Linda Malcom’s death can contact a tip line set up by the Port Orchard Police. The number is: 1-844-TIP-POPD, or 1-844-847-7673.